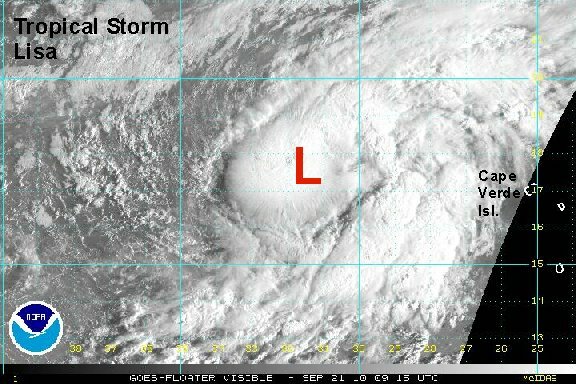 Lisa has formed from the 14th tropical depression of the season. Slow organization is expected over the next couple of days. 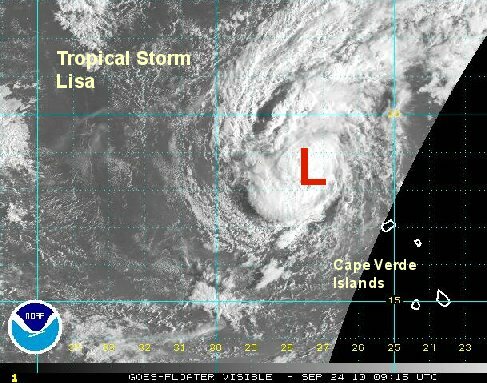 As of 5am edt / ast Lisa was centered near 17.7° N / 31.8° W or about 530 miles west northwest of the Cape Verde Islands. Top sustained winds are estimated at 40 mph (NHC 40 mph 5 am advisory). Movement is north at 5 mph. Pressure estimated at 1005 mb. Forecast models are taking Lisa slowly northwest then west northwest over the next several days. It is not a concern at this time. Lisa has gained a little convection today as it continues to barely move northward. 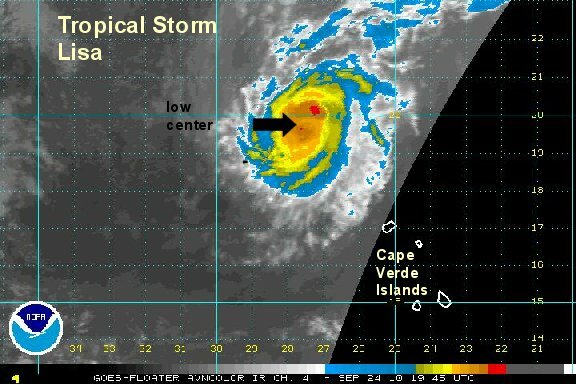 As of 3 pm edt / ast Lisa was centered near 18.3° N / 31.4° W or about 500 miles west northwest of the Cape Verde Islands. Top sustained winds are estimated at 45 mph (NHC 45 mph 11 am advisory). Movement is nearly stationary. Pressure estimated at 1002 mb. 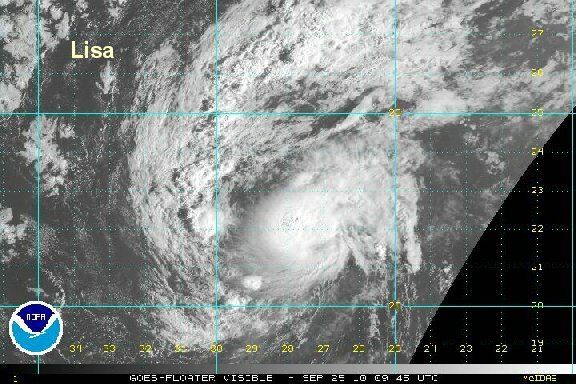 Lisa is actually closer to the Cape Verde Islands than yesterday at this time. It is moving erratically and probably is not even a tropical storm. We are going to be generous and give an estimate of 40 mph. As of 6 am edt / ast Lisa was centered near 18.0° N / 30.5° W or about 450 miles west northwest of the Cape Verde Islands. Top sustained winds are estimated at 40 mph (NHC 45 mph 5 am advisory). Movement erractic. Pressure estimated at 1002 mb. Forecast models are taking Lisa slowly northwest over the next several days.... It is not a concern at this time. Lisa has been moving erratically. If anything, drifting closer to the Cape Verde Islands. The western motion forecast for the last 24 hours has not shown up yet. Convection has increased a little, so we are matching the hurricane center's wind estimate of 45 mph. 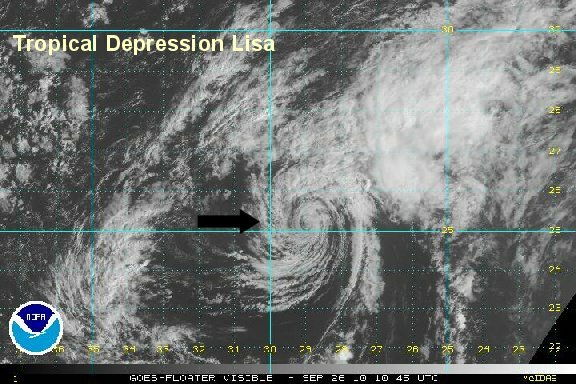 As of 3 pm edt / ast Lisa was centered near 17.7° N / 30.8° W or about 370 miles west of the northwestern Cape Verde Islands. Top sustained winds are estimated at 45 mph (NHC 45 mph 11 am advisory). Movement erractic. Pressure estimated at 1002 mb. Lisa was downgraded to a tropical depression this morning by the hurricane center. Deep convection is limited, but overallwith little change since last night. Top winds of 35 mph looks reasonable with 40 still a possibility. Lisa has drifted east overnight and is close enough to the northwestern Cape Verde Islands to bring rain. 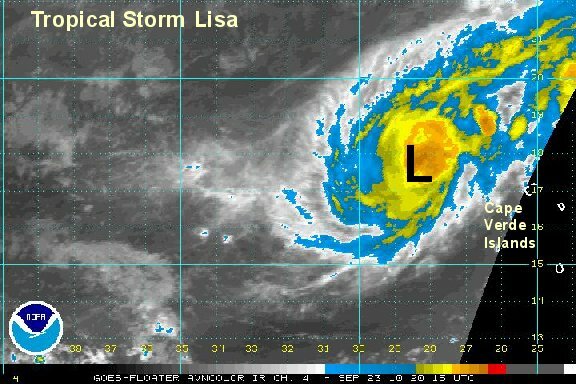 As of 6 am edt / ast Lisa was centered near 17.7° N / 29.0° W or about 345 miles west of the northwestern Cape Verde Islands. Top sustained winds are estimated at 35 mph (NHC 35 mph 5 am advisory). Movement nearly stationary. Pressure estimated at 1005 mb. Forecast models are taking Lisa slowly northwest over the next several days.... It is not a concern at this time. Lisa is a perfect example of why not to look at the "spaghetti charts" and take them at face value. Model forecasts have been taking Lisa northwest for a few days now. In reality the motion has generally east! The hurricane center has upped winds to 40 mph in Lisa. Deep convection is expanding and we estimate winds of 45 mph and increasing to 50 mph soon. Movement is stationary. Lisa was reinstated to tropical storm strength officially earlier today. A burst of deep convection has been associated with the circulation over the past six hours, but has started to die down recently. It's possible that the top wind sustained winds were near 45-50 mph several hours ago. At this time we are in agreement with the hurricane center and will call Lisa a minimal tropical storm. 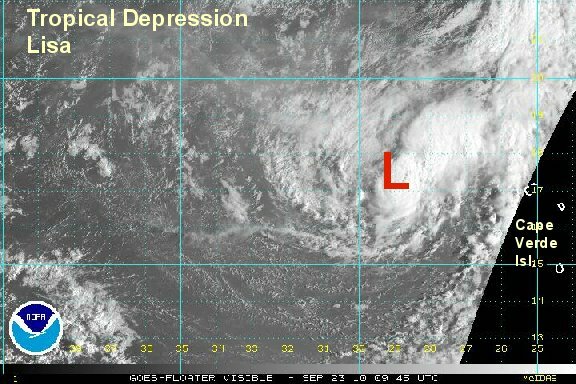 As of 7 pm edt / ast Lisa was centered near 17.5° N / 28.6° W or about 320 miles west of the northwestern Cape Verde Islands. Top sustained winds are estimated at 40 mph (NHC 40 mph 5 pm advisory). Movement nearly stationary. Pressure estimated at 1001 mb. Forecast models are taking Lisa slowly north northwest over the next several days into the open Atlantic. If you were to compare satellite images from the last several days of Lisa, you would notice that there has been little overall change. 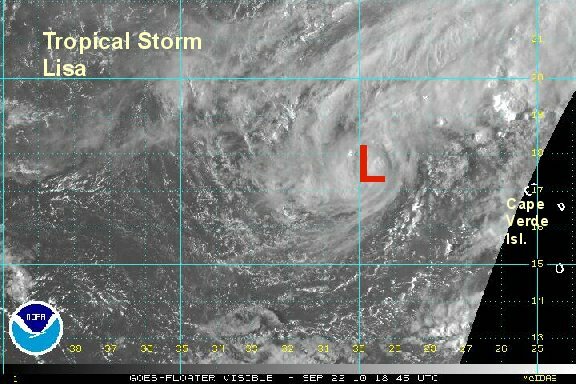 Lisa has been hanging on as a minimal tropical storm just out of reach of the Cape Verde Islands most of its life. There has been one postive note to report on... Lisa is actually trying to move according to the model forecasts for the first time. It has been drifting northeast the last several hours. The models have forecasted north. Not bad, considering its recent track record. Lisa continues to not be a concern. 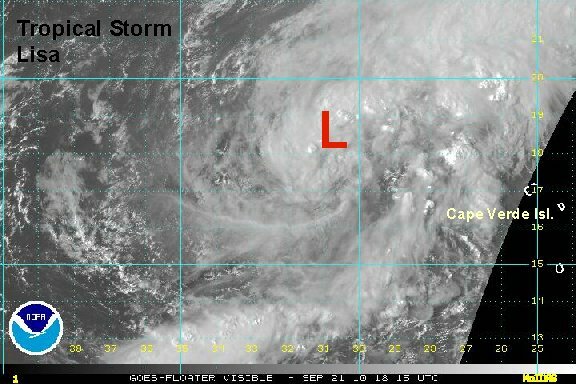 As of 7 am edt / ast Lisa was centered near 18.5° N / 27.7° W or about 300 miles northwest of the northwestern Cape Verde Islands. Top sustained winds are estimated at 40 mph (NHC 40 mph 5 am advisory). Movement northeast at 5 mph. Pressure estimated at 1004 mb. Forecast models are taking Lisa slowly north northwest over the next several days into the open Atlantic and weakening it. 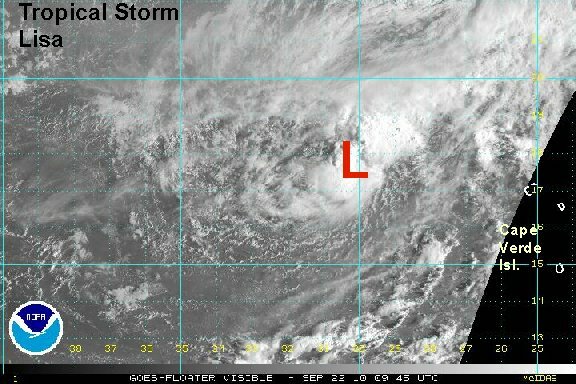 Lisa remains a small tropical storm as it is finally moving north away from the Cape Verde Islands. Deep convection is starting to decrease. The brief organization may be coming to an end. We are going under the hurricane center's estimate due to the convection decreasing some. As of 5 pm edt / ast Lisa was centered near 20.0° N / 27.8° W or about 370 miles northwest of the northwestern Cape Verde Islands. Top sustained winds are estimated at 50 mph (NHC 60 mph 5 pm advisory). Movement north at 8 mph. Pressure estimated at 999 mb. Last evening Lisa was upgraded to a hurricane officially. Top sustained winds were estimated at 80 mph. We are not in agreement thinking that Lisa is a solid tropical storm, but not a hurricane. No sense for a long discussion on this feature.... Lisa is a small tropical cyclone that is affecting no one. It is interesting to note how Lisa has bucked forecasts during its lifetime in strength and direction of motion. As of 5 am edt / ast Lisa was centered near 21.6° N / 28.1° W or about 470 miles northwest of the northwestern Cape Verde Islands. Top sustained winds are estimated at 60 mph (NHC 75 mph 5 am advisory). Movement north at 9 mph. Pressure estimated at 988 mb. Lisa has been sheared and is weakening rapidly. The low level circulation looks very weak and it probably is a minimal tropical storm. We still do not believe that Lisa was ever a hurricane and is much weaker than the official estimate. As of 4 pm edt / ast Lisa was centered near 23.4° N / 28.8° W or roughly 600 miles northwest of the northwestern Cape Verde Islands. Top sustained winds are estimated at 40 mph (NHC 70 mph 11 am advisory). Movement north at 12 mph. Pressure estimated at 988 mb by nhc. 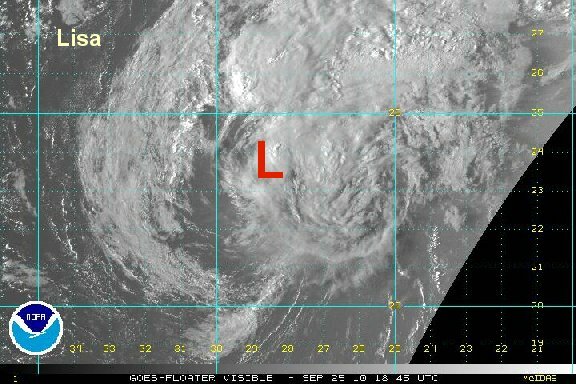 Lisa is moving north into the open north Atlantic. It continues to weaken and this will be our last advisory. Here is one last image of Lisa, now totally void of deep convection.